Thanks to everyone who came down and said hello to us on the Cambridge zine boogaloo stall at the Cambridge Creative Fair on Saturday. A fine time was had by all! Don’t forget, you can sign up to the Cambridge Zine Boogaloo mailing list here — our first meeting will be on Sunday 18th September, upstairs at the Maypole. Starting a zine night in my town of Cambridge — sign up to the mailing list or visit us on the scary/baffling world of Tumblr. Doing research and having meetings for a secret-mystery project involving a string quartet and a crazy/brilliant idea. Writing a zine about debt called Into the Red, which might be ready in time for debt season (a.k.a. Christmas). But then again, I might chicken out of ever publishing it at all. Preparing to table at my first ever fair next week with the talented Nick from Not Your Problem. More about that later. Writing a mini-zine called All about zines which is, erm, all about zines and probably contains less text than this here blog entry. But it is very informative. And there’s a picture of a space-rocket in it! I made it to celebrate the Cambridge Creative Fair. Polishing off Issue 5 of Angry Violist. It should be ready for the inaugural Camden Zine Fest on 8th October. FACT. Writing letters & going on epic bike-rides. Watching It’s Always Sunny in Philadelphia. Having a life outside of zine-making and writing. Or trying to. I have a full-time job too: leading a secret double life can be quite draining and stressful sometimes. 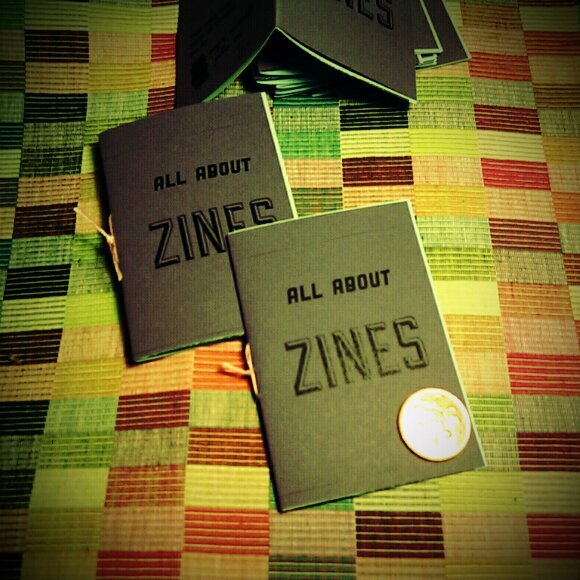 Well, here’s my new little zine, made for the Cambridge Creative Fair next Saturday. It’s 1/8th size, 8 pages, printed on blue paper with a purple cardstock cover and embroidery silk binding. I am helping to organise a regular meeting of zine and comix people in Cambridge — click the [amazing] image to sign up for more information. Our first meeting is upstairs at the Maypole, 18th September at 7pm. Tell your friends!